I recently created a set of architectural illustrations for a multifamily residential project. They represented various aspects of the rather large development. Among the goals the builder wanted to accomplish on this Italian style design were some marketing concepts of the rear courtyards on the townhomes. 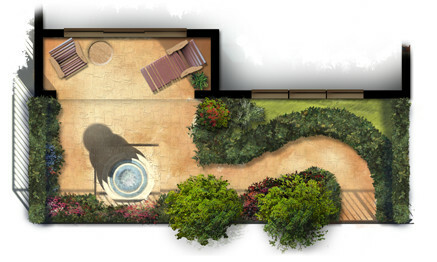 Small and simple, the plans reflect the way the outdoor courtyard spaces become part of each home’s living space. 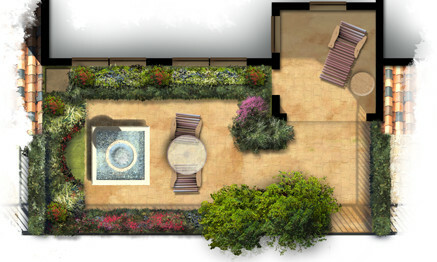 Each provides a fountain and sitting area with some low maintenance landscaping for aesthetics as well as privacy. 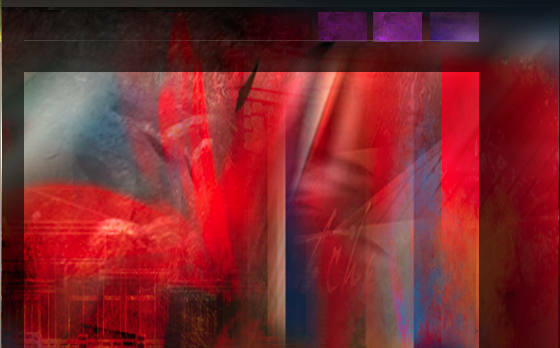 The artwork itself was created freehand in Photoshop using a variety of natural brushes. The landscaping plants themselves are loose and representational but suggest the colors and masses of possible garden ideas. The colors are bold and were carefully chosen to provide an eye catching marketing graphic for print as well as web presentation.